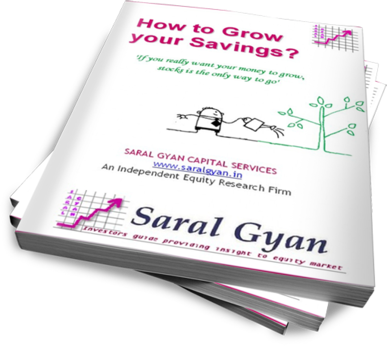 Saral Gyan's 88 Pages eBook - How to Grow your Savings? A complete guide to help you ensure, you get the best returns on your investments from equities. Getting the most out of this book is simple, “How to Grow your Savings?” requires practical approach. Execute your learning experience in your day to day life by managing your finances effectively and achieve your long term goals. Traditionally, Indians are Savers. The savings rate is as high as 30 percent. If not a direct savings in the bank, the money goes into a fixed deposit, gold or real estate. That trend might change soon if more people invest in stocks, which have outperformed every other asset class from 2001 to 2007. Stocks have outperformed other asset classes by as much as 60 percent, yet only 3 percent of Indian population directly invests in stocks. The main reasons for this is a lack of knowledge, awareness as well as unethical practices by a small minority of participants who encourage regular churning based on tips and rumours without giving proper financial planning to investors. If someone invested in a Bank of India fixed deposit account in 2001, he or she would have an 8 percent return per year. If the same person invested in Bank of India stock he or she would have a total return of 4,800 percent as the stock rose from 12 rupees to all time high of 588 rupees in 2010. Though Indians continue to be underinvested in the stock market there is more interest coming in from all corners. 200,000 new demat accounts are opened every month. Recent transparency measures should also bring more people in. The stock market will no longer be treated as a gamble but will be put on par with real estate and gold. The irony is that even though stock markets as a long term asset class have given the highest returns, short term trading in futures and options has also caused the maximum losses. The maximum numbers of bankruptcies were caused due to the stock market crash in 2008-2009 amongst high risk speculative traders. How much can you make in 30 years by just investing Rs.10,000 initially in any of financial instruments? Let us look at the real example. If you have subscribed for 100 shares of "X" company with a face value of Rs. 100 in 1980. In 2010, you have whopping 9.6 million shares of the company. Any guess about the company? Any guess about the present valuation of Rs. 10,000 invested in 1980? The company which has made fortune of millions is "WIPRO" with present valuation of 450+ crores (excluding dividend payments) for Rs. 10,000 invested in 1980. Unbelievable, isn’t it? But it’s a Fact! Investing in companies with good fundamentals and proven track record can give far superior returns compared to any other asset class (real estate, precious metals, bonds etc) in a long run. Will Wipro provide similar returns in next 30 years? Probably not, it’s already an IT giant. You need to explore companies in small and mid cap space with good track record and stay invested to create wealth in a long term. It is a garden out there and one need to simply provide sufficient time to grow his quality seeds to get the fruits. One has to know what he is doing and has to be cognizant about it. With a little research and patience stock market investments can yield maximum returns. So, how will you grow your savings? What are you investing in? Read complete e-book "How to Grow your Savings? ", its not only for beginners but also is a must read for experienced investors. "How to Grow your Savings" will definitely help you to get an edge over others by understanding the basic of investments and importance of equities in a long run to generate income and create wealth. Below are the chapters covered in "How to grow your Savings?" Saral Gyan's 88 pages e-book is priced at Rs. 499 ($ 11.99) only. Wait! You can grab it for free by subscribing to one of our most admired service - Hidden Gems. Click here to view the Past Performance of Hidden Gems, Value Picks & Wealth-Builder.